Draft: 2013, Kansas City Royals, 1st rd. Full name is Hunter William Dozier…resides in Argyle, Texas, with wife, Amanda, and son, Bodhi...Graduated from Denton (Texas) High School…lettered in both baseball and football…missed his senior football season due to a broken collarbone...Attended Stephen F. Austin University…left as the school's career leader in hits and doubles…named Southland Conference Player of the Year in 2013 and a finalist for the Brooks Wallace Award (best shortstop in college baseball)...Participated in Royals FanFest each of the last three years (2017-19)...also participated in a Special Olympics Clinic and a PLAY Clinic for area youth through Royals Charities. 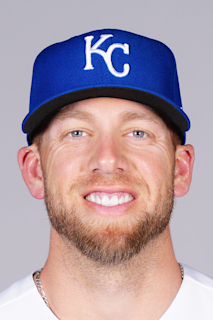 Started in 95 of the Royals' 122 games following his May 14 recall, including starts at: first base (50), third base (35), designated hitter (8) and right field (2)…after starting at first base, designated hitter or right field in each of his first 39 games, 35 of his last 56 were at third base...Hit .295/.336/.543 (31-for-105) with 14 extra-base hits (5 HR) and 13 RBI during a 29-game stretch from July 23-Sept. 4...During a three-week stretch from Aug. 16-Sept. 4, his average exit velocity of 93.6 mph ranked eighth in the Majors, according to Statcast...He and fellow rookie Ryan O'Hearn homered in the same game four times, including: Aug. 24, Aug. 31, Sept. 3 and Sept. 25…they were the first set of Royals rookies to each hit double-digit home runs in the same season since Angel Berroa (17) and Ken Harvey (13) in 2003...Five of his 11 homers gave the Royals a lead, including a solo HR in the ninth inning on Sept. 25 in Cincinnati that broke a 3-3 tie...Hit his first career home run on May 30 vs. Minnesota off Aaron Slegers, a solo shot in the seventh inning of an 11-8 win...Hit his first career walk-off homer on Aug. 24 vs. Cleveland…it was the second of back-to-back homers with O'Hearn, making them the first duo of rookies in Major League history to hit back-to-back game-tying and game-ending HR in the ninth inning or later, according to Elias Sports Bureau...Six of his 11 homers and 19 of his 34 RBI came in his last 32 games from Aug. 22 through season's end…he had just five roundtrippers and 15 RBI through his first 70 games... Reached safely in five of his six plate appearances as a pinch-hitter, including three hits, most by a Royal since Billy Butler (4) in 2014…had a game-tying pinch-hit double in the ninth inning on Sept. 18 at Pittsburgh. Limited to a career-low 33 games due to a strained left oblique and a left hand injury ... Started the season on the 60-day DL with a strained left oblique…made three rehab appearances in Wilmington (A) and two in Omaha (AAA) before being reinstated on June 1 ... Placed on the 7-day DL on June 9 with a left hand injury…returned on Aug. 2 for a six-game rehab stint with Northwest Arkansas (AA), before being reinstated with Omaha on Aug. 15 ... All four of his home runs came in 17 games following his second DL stint, including a two-homer game on Aug. 19 at Round Rock ... Played in 19 games with Naranjeros de Hermosillo of the Mexican Winter League and hit .211 (16-for-76) with four homers and 12 RBI. Hit .296/.366/.533 between Omaha (AAA) and Northwest Arkansas (AA), setting career highs in runs (79), hits (144), doubles (44), homers (23) and RBI (75)...Selected from Omaha on Sept. 2 and made his Major League debut on Sept. 12…recorded his first hit on Sept. 15 and first RBI - a go-ahead single in a 3-2 win over Chicago - Sept. 17...Played in eight games with Kansas City and made five starts, all in right field...Named Omaha Player of the Year, batting .294/.357/.506 (115-for-391) with 15 homers and 54 RBI in 103 games…finished second in the PCL with 36 doubles despite not making his debut until May 7...Recorded three multi-home run games, including two with Omaha on May 19 and July 25...Batted .305/.400/.642 (29-for-95) with eight home runs and 21 RBI in 26 games with the Naturals before his promotion to Triple-A. Entered 2015 rated as the No. 5 prospect in the Royals' minor league system by Baseball America ... Spent the entire year with Northwest Arkansas (AA), playing in 128 games…tied for ninth in the Texas League in games played, 10th in runs scored and tied for 11th in doubles. Tabbed Wilmington Player of the Year in 2014, leading the club in on-base (.397) and slugging (.429) ... Rated by Baseball America as the seventh-best prospect in the Royals' organization before the 2014 season…also named "Best Hitter for Average" and hitter with the "Best Strike-Zone Discipline." ... Played for the Peoria Javelinas in the Arizona Fall League in 2014…hit .256 (22-for-86) with six doubles, a homer and a .390 on-base percentage…named to the AFL's All-Prospect Team. Rated as the Pioneer League's top prospect by Baseball America in 2013 ... Led the Pioneer League in doubles…also finished fifth in walks and on-base percentage (.403), sixth in OPS (.912) and ninth in slugging (.509). May 14, 2018 Kansas City Royals recalled 1B Hunter Dozier from Omaha Storm Chasers. March 13, 2018 Kansas City Royals optioned 3B Hunter Dozier to Omaha Storm Chasers. November 9, 2017 Naranjeros de Hermosillo placed 3B Hunter Dozier on the reserve list. October 28, 2017 Naranjeros de Hermosillo activated 3B Hunter Dozier. October 24, 2017 Naranjeros de Hermosillo placed 3B Hunter Dozier on the reserve list. October 10, 2017 3B Hunter Dozier assigned to Naranjeros de Hermosillo. October 2, 2017 Kansas City Royals recalled Hunter Dozier from Omaha Storm Chasers. August 15, 2017 3B Hunter Dozier assigned to Omaha Storm Chasers from Northwest Arkansas Naturals. August 2, 2017 3B Hunter Dozier assigned to Northwest Arkansas Naturals from Omaha Storm Chasers. June 9, 2017 Omaha Storm Chasers placed 3B Hunter Dozier on the 7-day disabled list retroactive to June 7, 2017. June 1, 2017 Kansas City Royals optioned 3B Hunter Dozier to Omaha Storm Chasers. May 29, 2017 Kansas City Royals sent 3B Hunter Dozier on a rehab assignment to Omaha Storm Chasers. May 23, 2017 Kansas City Royals sent 3B Hunter Dozier on a rehab assignment to Wilmington Blue Rocks. April 2, 2017 Kansas City Royals recalled 3B Hunter Dozier from Omaha Storm Chasers. April 2, 2017 Kansas City Royals placed 3B Hunter Dozier on the 60-day disabled list. Strained left oblique. March 17, 2017 Kansas City Royals optioned 3B Hunter Dozier to Omaha Storm Chasers. October 25, 2016 3B Hunter Dozier assigned to Tigres del Licey. September 2, 2016 Kansas City Royals selected the contract of Hunter Dozier from Omaha Storm Chasers. May 7, 2016 3B Hunter Dozier assigned to Omaha Storm Chasers from Northwest Arkansas Naturals. January 19, 2016 Kansas City Royals invited non-roster 3B Hunter Dozier to spring training. January 26, 2015 Kansas City Royals invited non-roster 3B Hunter Dozier to spring training. June 19, 2014 3B Hunter Dozier assigned to Northwest Arkansas Naturals from Wilmington Blue Rocks. April 2, 2014 3B Hunter Dozier assigned to Wilmington Blue Rocks from Idaho Falls Chukars. March 21, 2014 3B Hunter Dozier assigned to Kansas City Royals. August 31, 2013 3B Hunter Dozier assigned to Idaho Falls Chukars from Lexington Legends. August 12, 2013 Hunter Dozier assigned to Lexington Legends from Idaho Falls Chukars. June 19, 2013 Hunter Dozier assigned to Idaho Falls Chukars. June 10, 2013 Kansas City Royals signed SS Hunter Dozier.